Wat Arun in Bangkok, also known as the Temple of the Dawn, is located on the western side of the Chao Phraya River. Due to its amazingly beautiful architecture and the most iconic location right on the river, a visit is a must do on every Bangkok trip. Besides that, also the boat ride for getting there is overwhelmingly beautiful and a unique Bangkok experience. Particularly scenic are the approximately 70-meter-high pagodas that characterize the riverside, and which are beautifully lighted at night. Many consider Wat Arun as the most beautiful temple in the city of Bangkok and so a visit is highly recommended. The best time for a visit is at sunset, but more about this a bit later. 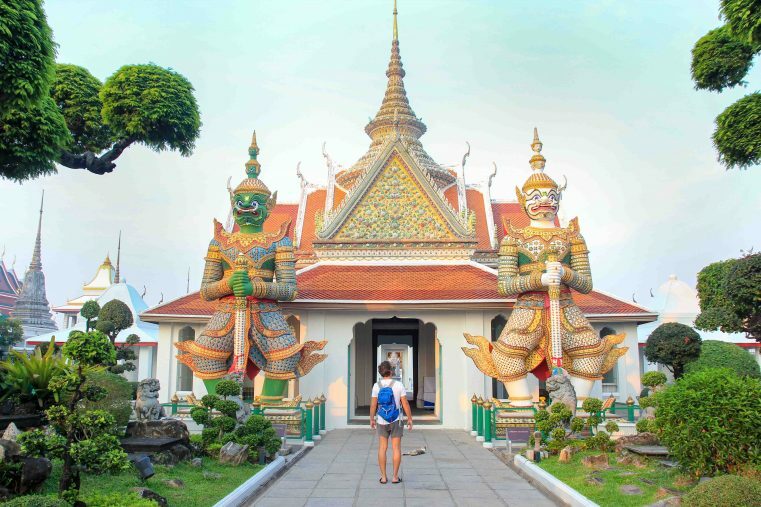 In this blog guide we give you all the important information about Wat Arun, how to get there, costs and opening hours. Of course, we share our experiences, give you useful tips and show you the most beautiful images of this temple jewel. First of all, plan enough time for a trip to Wat Arun. The temple complex is larger than you may know, and you will find many beautiful buildings, pavilions, buddhas and statues to discover. The best time to visit is in the morning or late afternoon. At this time, you can expect less tourists and the atmosphere will be much more idyllic. A particularly great place to take amazing Wat Arun images is the entrance to the Ubosot. The two huge statues, the Yakshas, ​​are beautifully decorated and give access to the ordination hall of the monks. Go there early and you will have this scenic area to yourself. 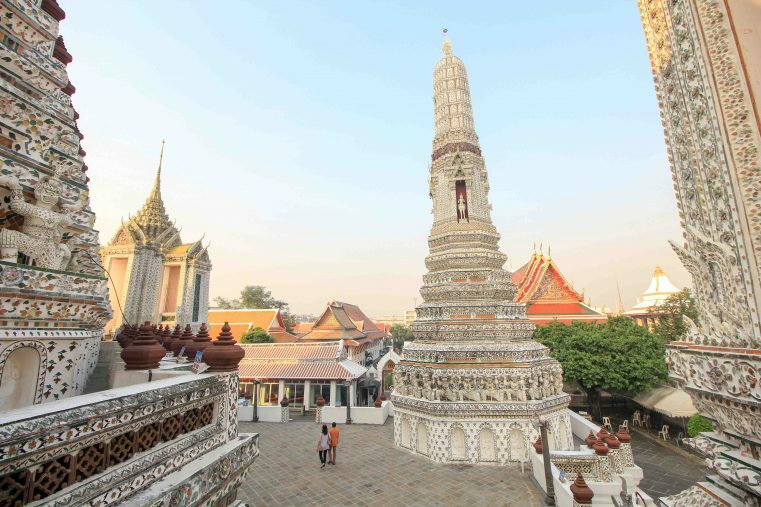 This area of ​​the temple complex is considered the holiest part of Wat Arun. 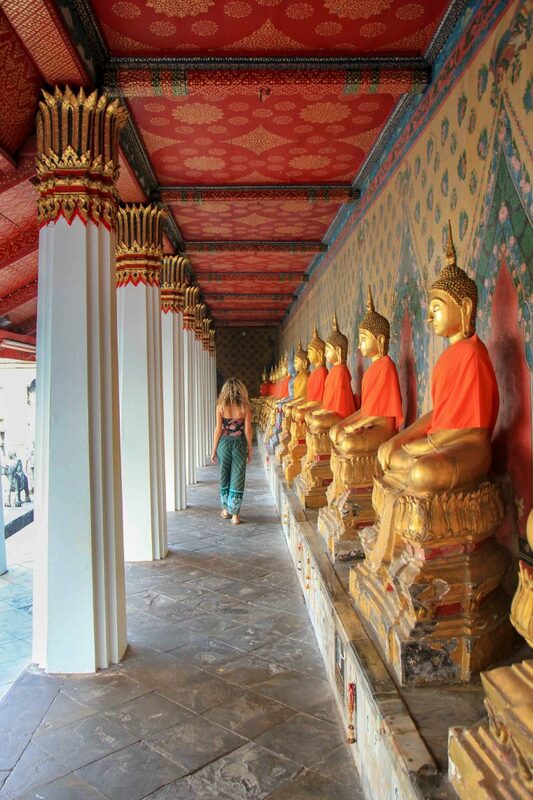 Especially the beautiful corridors with the Buddha statues made us fall in love with this lovely temple. Additionally, there are amazing Instagram photo opportunities. Another highlight of the temple is the marble-clad courtyard. 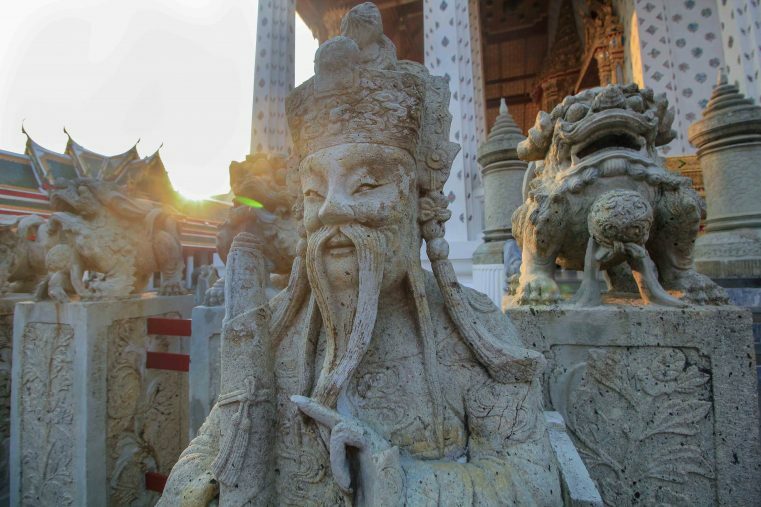 Numerous Chinese stone sculptures show lions, dragons, warriors and other mystical figures. Wat Arun is famous for its beautiful Phra Prang. This landmark of Wat Arun is a 70-meter-high temple tower, a stupa-like pagoda. Even from afar you can see it shining brightly in the midday sun. This white temple is decorated with beautiful mosaics of porcelain and shells, which make up thousands of floral patterns. Steep stairs lead up to the temples and it’s hard to believe that this dizzying ascent was once allowed to be climbed by visitors. Today, you can still visit the Phra Prang but climbing the temple is forbidden. 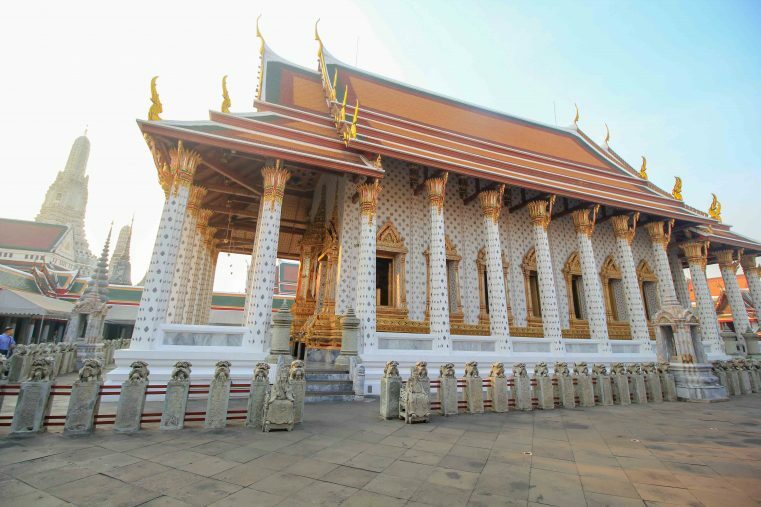 Tip: This is the only temple area where you have to pay an entrance fee and there is also a strict dress code. More of it later in the blog! The history of Wat Arun dates back to the Ayutthaya era. At that time, this temple was still called Wat Makok, which is translated as the olive temples. 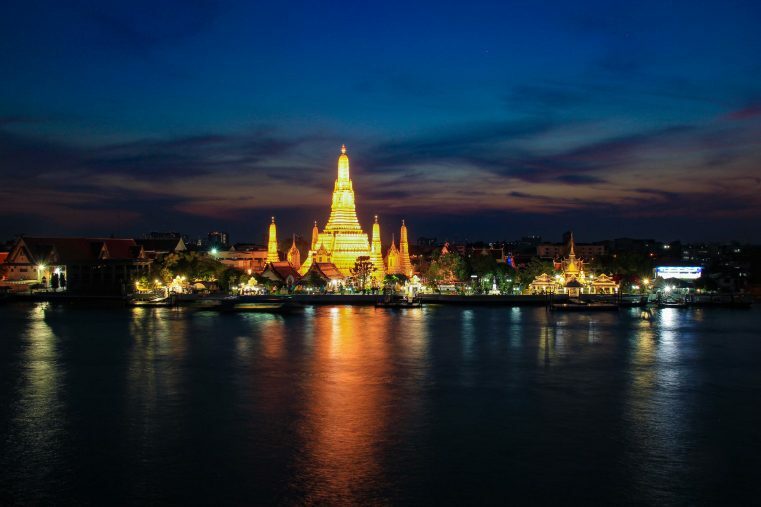 The Name Wat Arun was named after Aruna, the Indian god of the dawn. Therefore, the name Temple of the Dawn. Architecturally, the temple is modelled after a representation of Mount Meru, the centre of the world in Buddhist cosmology. In the first half of the 19th century, the temple was restored by King Rama II and the then only 16 -meter-high towers were raised to about 70 meters. 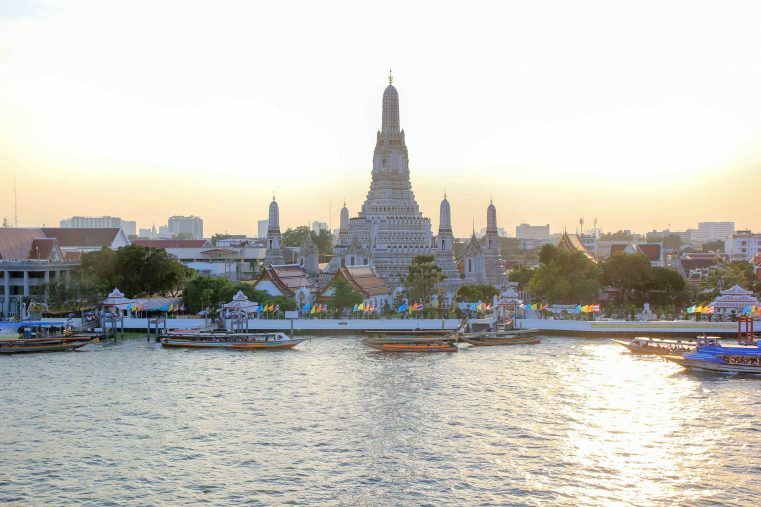 Wat Arun at sunset – you can hardly experience anything more magical than this temple. Opposite, on the other side of the river, you will find several rooftop bars from where you can admire the best view of the temple. 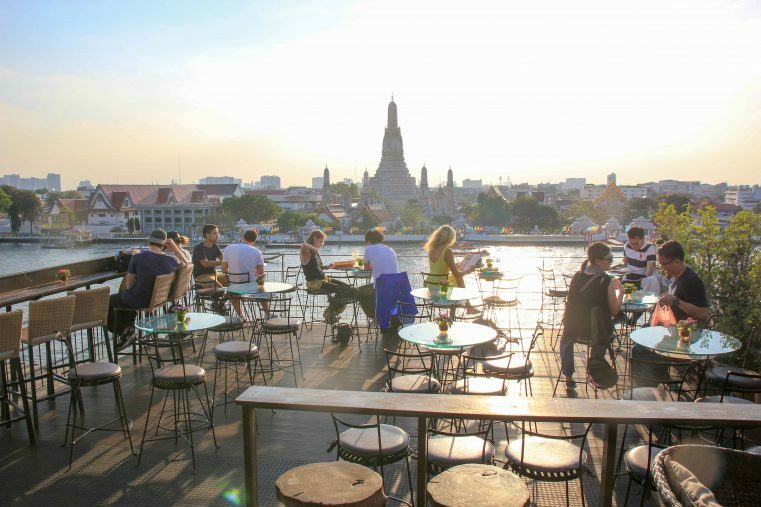 The absolute best view of the Wat Arun for watching the sunset you will definitely have from the roof terrace of the rooftop bar Eagle Nest in the hotel Sala Arun. From this photo spot you can take amazing pics of the Wat Arun at Sunset and watch the sun go down at 18:00 o’clock. If you are hungry, you can eat here but it is also okay if you just order a drink here. Here, you also have a fantastic view of Wat Arun at night. When it is dark the temple is brightly lit, and you can do some fantastic night shots. So, if you ask yourself, which is the best place to photograph Wat Arun at night or at sunset you definitely should go to the Eagle Nest Bar. Tip: Hotel guests of the Sala Arun Hotel also have the possibility to enjoy the Wat Arun at sunrise from the breakfast terrace. For the entrance to the Wat Arun one should pay attention to appropriate clothing. Especially when entering the towers, the dress code is controlled. Not properly dressed guests can borrow scarves at the entrance. The dress code says: no shorts, wear long pants, cover your knees, cover your shoulders. Open shoes and flip flops are allowed. The Opening Hours of Wat Arun are from 08:00 am to 05:30 pm. The entrance to Wat Arun temple complex is in general without costs. In case you want to visit the temple towers you will have buy yourself a ticket: Entrance fee is per 50,- Baht per person at the moment. This temple is located very centrally. 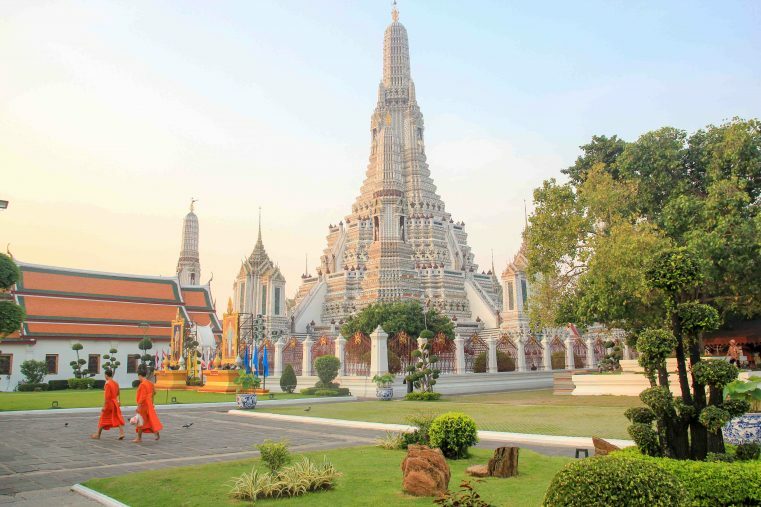 Situated near the main attractions of Bangkok, getting to Wat Arun is relatively uncomplicated. The nearest places are Wat Pho and the Royal Palace, you only need to cross the river to get to the temple. For that, take the ferry from Tha Tien Pier. The boat will take you for only 3 baht just in front of the Wat Arun for only 3 baht. Although the boat trip does not take long, it is still a wonderful experience. There is no BTS station in the close proximity. Certainly, you also can go there by taxi. Conclusion: The Wat Arun in Bangkok is definitely one of the most beautiful temples in the city. Its architecture, the pretty decorations and the unique location next to the river make this temple a Must-see Temple in Bangkok. A boat trip to Wat Arun is highly recommended and should not be missed on any city trip to Bangkok!